This is a wallpaper I made 2 years ago for the MT Knockout Competition. I haven't posted it because I used a fanart from Pixiv and it didn't hit me till now to search the fanart I used and ask for the original artist's permission. So I asked for it and surprisingly (or not, since Pixiv artists are mostly sweethearts), the answer was yes. 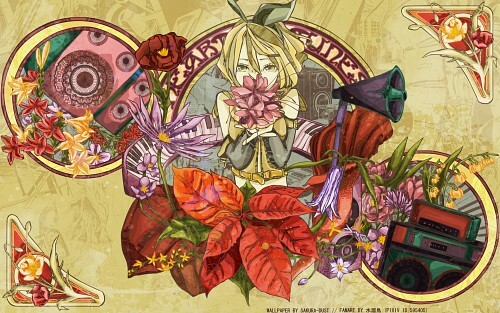 I used this amazingly shiny fanart: Kagamine Rin. This artist has a unique style and gorgeous gallery, I suggest you browse through those fanarts. loveloveloveit! can't express how much i liked this piece. the all composition is absolutly great! But did you draw some of these flowers? or did you vectored them from other images? This is so lovely... Lovely colours and vectoring as usual. The design is great, I especially love all the flowers and intricate designs on the speakers... Love it all XD Amazing job! I think I forgot to comment on this one! This is a nice wall but I'm not used to you doing abstract walls. I'm used to seeing your walls in scenic multilayered shading. But this change of style is good!. oh and you managed to get an ok for it from a pixiv user, nice! Beautiful Venus de Milo montage as always, Sakura-Dust - only that our Venus comes out from a froth of flowers! The composition is so freaking awesome.